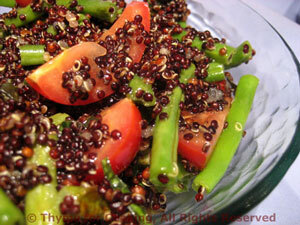 Warm Quinoa and Green Bean Salad, Thyme for Cooking summer side dish. Quinoa is very high in protein and "contains a balanced set of essential amino acids for humans, making it an unusually complete food" according to Wikipedia. Combine with green beans and a light vinaigrette for a healthy salad. You could substitute Basmati or Jasmine rice. Combine quinoa and stock in small saucepan. Cover and bring to a boil. Top and tail beans and cut into bite-size pieces. Put a medium saucepan 2/3rd's full of water on high heat. When boiling add beans and blanch for 3 minutes. Make vinaigrette: Mix soy sauce, lemon and oil in a small bowl, whisking vigorously to thicken. When quinoa is done, put it into a medium bowl. Add tomato, pepper, beans, basil and stir to combine. Add vinaigrette and stir gently.